Heimaland is a beautiful guesthouse in Iceland where travelers can experience exquisite stillness and the best South Iceland has to offer. Heimaland has accommodation in bright and cozy rooms where one can relax after an eventful day. 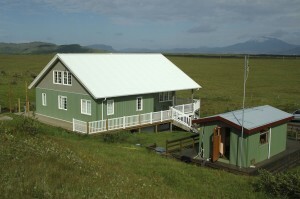 Heimaland is a small (summer) guesthouse with five double rooms. Our goal is to provide easy going and personal service, making our guests feel as comfortable as possible, when you stay in Iceland. The views from Heimaland are magnificent where the mountains Hekla, Eyjafjallajökull and Þríhyrningur are very prominent. We are located on road no. 26 (only 17km from road 1). From Reykjavík its around 100 km – around 1 hours drive.